Parent Dell Technologies has child Dell EMC singing off a multi-cloud and hyperconverged songsheet at sibling VMware’s Glitter Gulch VMworld event. The two main product families featured are the Data Domain data protection target array and VxRAIL hyper-converged lines. VMware is pushing the notion of a multi-cloud world needing common infrastructure platforms, services and tools across the on-premises and public cloud worlds to facilitate workload transfers between the on- and off-premises environments. Dell EMC is playing very nice with this idea. Data Domain cloudification gets use of the public cloud as a disaster recovery (DR) site, with application-consistent cloud disaster recovery in AWS and recovery to VMware Cloud on AWS. Data Domain Virtual Edition is Data Domain software running in the cloud. V 4.0 adds KVM hypervisor support, up to 96TB of in-cloud capacity and it can use AWS S3 and Azure Hot Blob object storage for backup storage. Dell EMC’s Data Protection Suite can use cloud storage for backup and retention as well. Cloud Snapshot Manager gets Azure support as well as AWS. 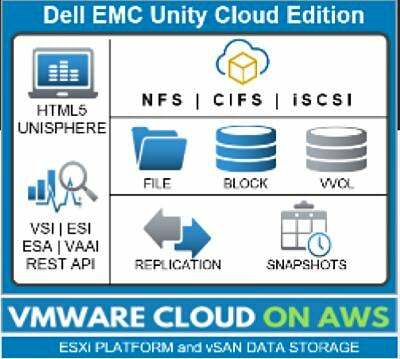 There is a Cloud Edition of the Unity VSA (Virtual Storage Appliance) block and file access array. It can be deployed with VMware Cloud on AWS and have up to 256TB filesystems. Dell EMC suggests using it for test and development or for DR in the cloud. CloudIQ, the no-charge cloud-based array performance analysis service, gets mobile app access via iPhone and Android. It has VMware integration, providing virtual machine-level performance and capacity insights, and has added support for PowerMax, VMAX and XtremIO in addition to the existing Unity and SC Series arrays. There is the potential here for cross-array type analysis and, dare we suppose, data movement? VxRail gets stretch clusters in the cloud. New options of the VMware Validated Designs for VxRail support distributed multi-availability zones architecture and multi-site deployments with disaster recovery. Releases will be synchronised with less than 30 days between new VMware product versions and corresponding VxRAIL ones. VMware Cloud Assembly, a SaaS-based cloud management solution part of VMware Cloud Services, will feature VxRail integration. There is also Dell EMC Networking Fabric Design Center support for VxRail. Vmware and VxRail are playing together to boost each others products; VSAN from VMware and storage and servers from Dell EMC. VxRack SDDC gets support for VMware Cloud Foundation v2.3.2. and will support future releases. It has almost full alignment with VxRail offerings; P, E, and V series and the storage-dense S-series. Dell Financial Services aims to offer easier ways to pay for multi-cloudification, with Cloud Flex for HCI requiring no up-front investment and declining payments over time with no obligation after the first 12 months. Ready Capacity provides on-demand storage and buffer capacity that can scales to match usage changes. Flex on Demand lets users deploy an initial base capacity and pay for buffer capacity as it is used. The Dell EMC and VMware multi-cloud blanket is getting wider and deeper as Dell seeks to keep its customer base contented and reassured, and gain new converts to the Dell EMC VMware way of doing IT.